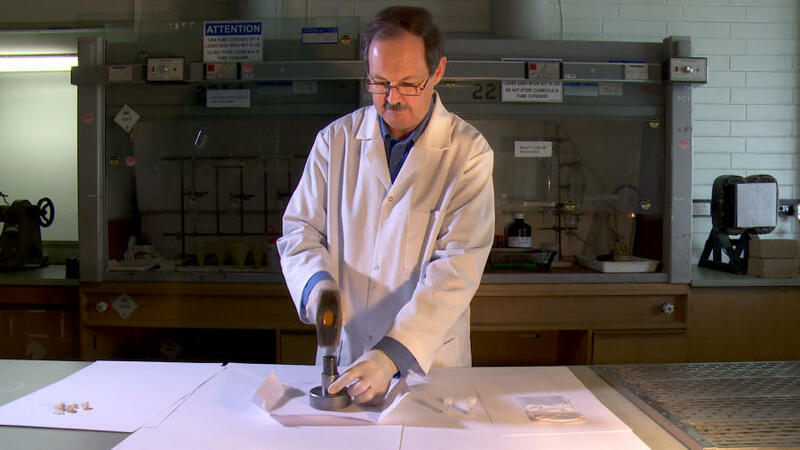 Professor David Phillips places a gem-quality 8-carat diamond into a small metal tube. He inserts a solid metal cylinder into the tube, being careful not to disturb the position of the diamond. Then, he gently lifts a mallet, takes aim at the cylinder and smashes the diamond into small pieces. Unsure why he’s smashing such a jewel? It’s all about finding the mother lode. But first, we need to travel back in time. You can’t find the mother lode without breaking a few diamonds. Long ago and deep below the Earth’s surface, the pressure is 60 times that found in the deepest ocean trenches and the temperature more than 1000 degrees Celsius. Here, pure carbon is compacted and crystallised into a near-flawless, 8-carat diamond. And there the diamond sits, 180km down, for hundreds of millions of years. One day, a volcanic eruption (called a kimberlite) shoots the diamond up through the Earth’s mantle and crust. Some time after the eruption, a river (or maybe a glacier) slowly moves this diamond far from its source volcano and eventually it’s buried under sediment. Fast-forward tens of millions of years and the stone is discovered in an old riverbed in South Africa. Normally the diamond would now be cut, polished and mounted in an expensive piece of jewellery. But this diamond is slightly flawed; inside it are two tiny green imperfections. But rather than reducing its value, these imperfections make the diamond more valuable than its 8-carat weight suggests. Not as jewellery, but as a tool for finding out more about diamonds. Over time, diamonds from a single volcano may be spread far and wide. The dream of diamond prospectors is to find the original source, or mother lode. “As diamond is the hardest natural mineral, diamonds are able to survive prolonged transportation and sedimentary recycling,” says Professor Phillips, geologist and Head of the School of Earth Sciences at the University of Melbourne. Some of these eroded diamonds become concentrated in sedimentary deposits called placer deposits, sometimes far removed from their original volcanic source. Professor Phillips says while it is sometimes possible to track a diamond’s source volcano by, for example, following an old river to its source, continental changes over geological time scales mean this is often impossible. “There are numerous placer diamonds deposits worldwide where the source is unknown,” says Professor Phillips. These include the Copeton and Bingara diamond deposits in New South Wales, Australia, and some of the well-known diamond deposits along the west coast of southern Africa and in the Wolmaransstad area of North West Province, South Africa. 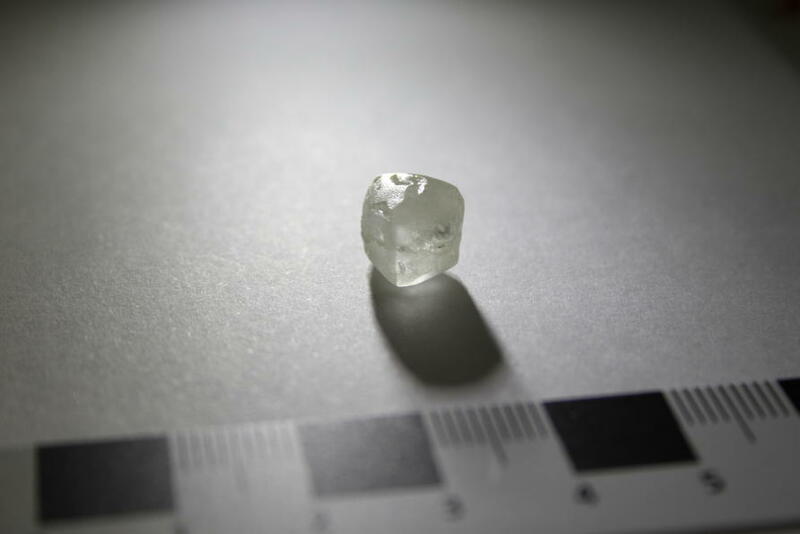 “The origin of the Wolmaransstad alluvial diamond deposits have been the subject of much debate, and several exploration companies have attempted to find the source of these diamonds and the possible mother lode, but without success,” says Professor Phillips. But a new diamond age dating technique pioneered by Professor Phillips and his colleagues might just unlock the code. If cut and polished, this 0.75 carat diamond would make a smashing diamond ring. Picture: Scarlett Blewett. “Some diamonds contain small mineral inclusions that provide insights into the environment of diamond formation,” says Professor Phillips. This allows us to determine the age of these minerals. Recent research by the University of Melbourne group has shown that the age given by this dating method is not when the diamond was formed, but when it erupted out of a volcano. Professor Phillips says knowing the age of the volcanic eruption helps focus the search for the mother lode to specific geological layers. “It’s like looking for a unique word in War and Peace and instead of having to search the whole book, you only have to look through a handful of pages,” he says. The group previously dated clinopyroxene inclusions in diamonds from the Namibian coast and showed that they likely originated from the erosion of volcanoes more than 700km away, before travelling by river to the coast. 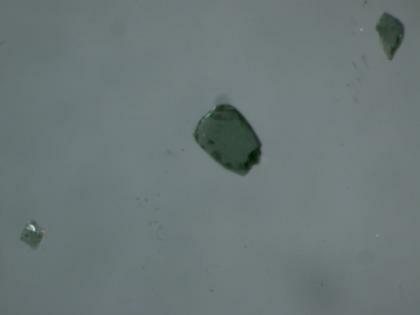 Clinopyroxene inclusions, isolated for age analysis. Picture: David Phillips. When exploration company Namakwa Diamonds heard about the Namibian findings, they sent Professor Phillips two diamonds with clinopyroxene inclusions from South Africa for analysis. “Clinopyroxene-bearing diamonds are very rare, so this is an exciting opportunity to solve a long-term controversy,” Professor Phillips says. The largest diamond was a high- quality 8-carat macle (twin-diamond) containing two clinopyroxene inclusions. It was valued at about US$4,500 uncut. The second gemstone weighed about 0.75 carats and contained two clinopyroxene inclusions. For the age dating method to work, the inclusions need to be removed from the diamond, and the only way to do this is to break it. Breaking a diamond to extract the inclusion intact is a delicate task, although it does involve a hammer. The moment of truth. Picture: Paul Burston. 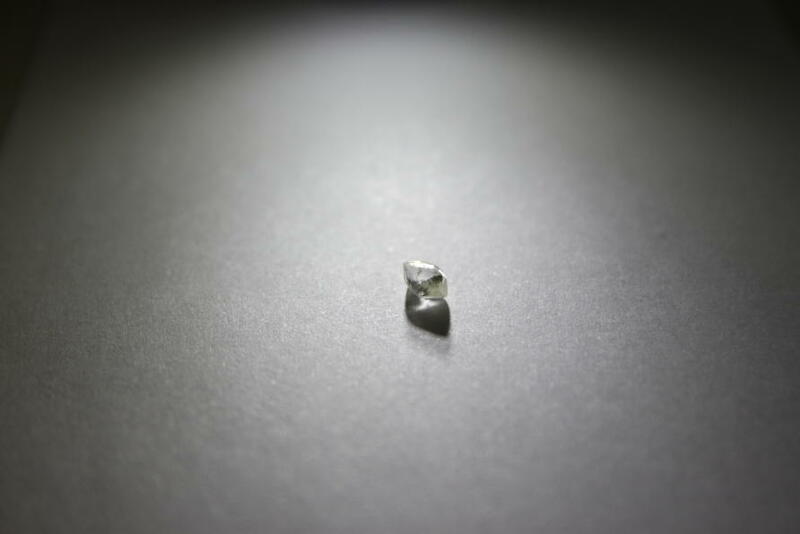 “Our previous project involved the extraction of clinopyroxene inclusions from small stones, less than 0.3 carats, which are relatively simple to break and extract the inclusions. “Large stones are far more challenging. There is a risk of pulverising the clinopyroxene inclusions and ruining the experiment - and the diamond. Our video shows the moment of truth. After successfully extracting the inclusions from the two diamonds, Professor Phillips has them sent to be irradiated at the Oregon State University research nuclear reactor. The irradiated inclusions will be cooled for three months and then placed in a vacuum chamber and melted with a high-energy laser. This process will release argon, which is the product of the radioactive decay of potassium. The argon gas will be measured in the University of Melbourne’s state-of-the-art spectrometer, and from this, the diamonds’ source volcano ages will be calculated. For anyone sad about such beautiful diamonds being crushed into tiny fragments, Professor Phillips says it’s OK, the diamonds still have value … for science. Banner Image: Professor David Phillips showing off the 8-carat South African diamond. Picture: Paul Burston.